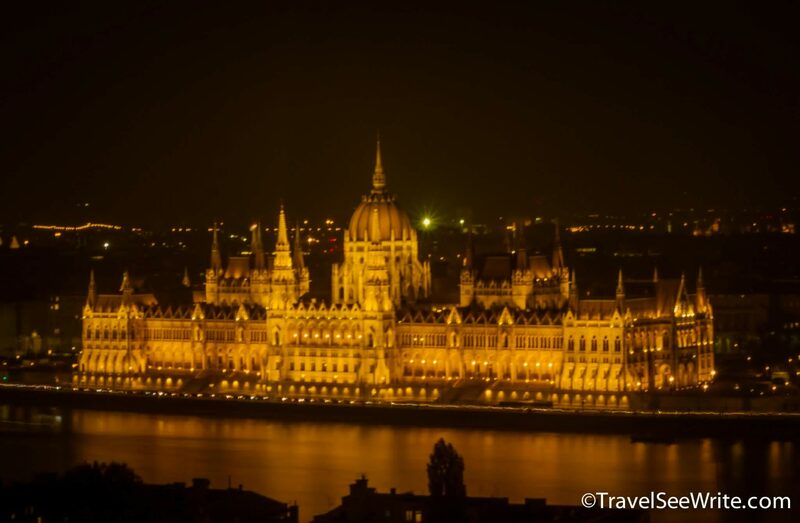 Budapest, “the Paris of the East” is a city that must be savoured with all senses. 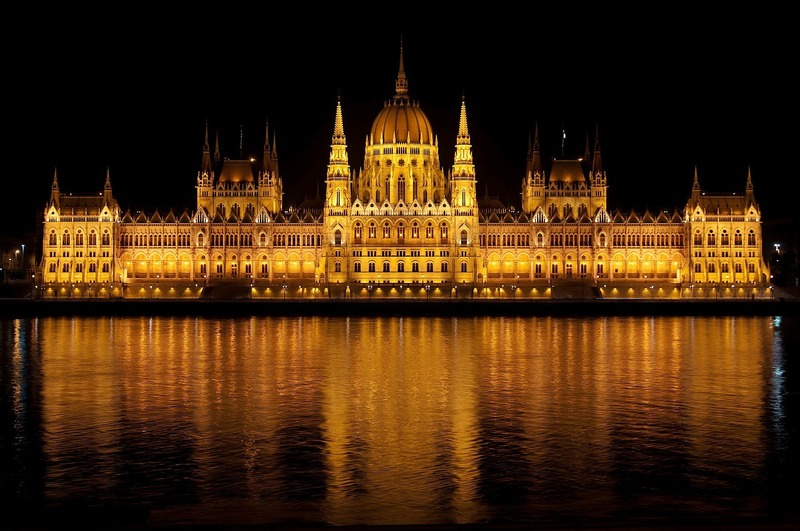 The striking beauty of the capital city of Hungary is half God-given and half enhanced by the humankind. 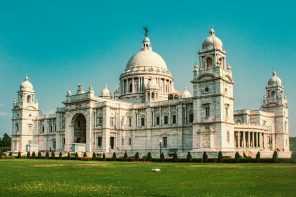 A treasure trove for architecture lovers – baroque, neoclassical, Eclectic and art nouveau buildings. The city is so beautifully restored it feels like you are walking through its “golden age”. No wonder in 1987 it got entry into the prestigious UNESCO World Heritage List for cultural and architecture. 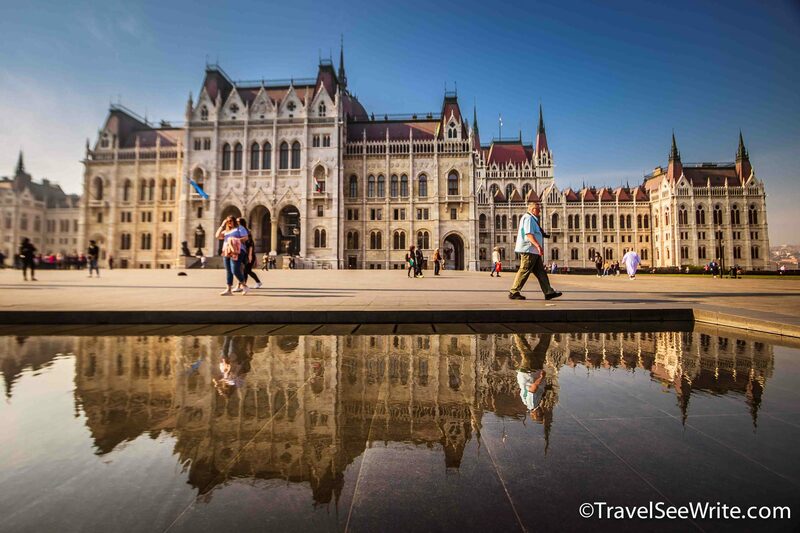 And, it’s not just the architecture, history and scenic beauty that makes Budapest the darling of visitors. It has a youthful vibe, pulsating nightlife, and a top-notch classical music scene. And, who could forget it’s natural thermal baths and mouth-watering Hungarian cuisine, which is much more than goulash. 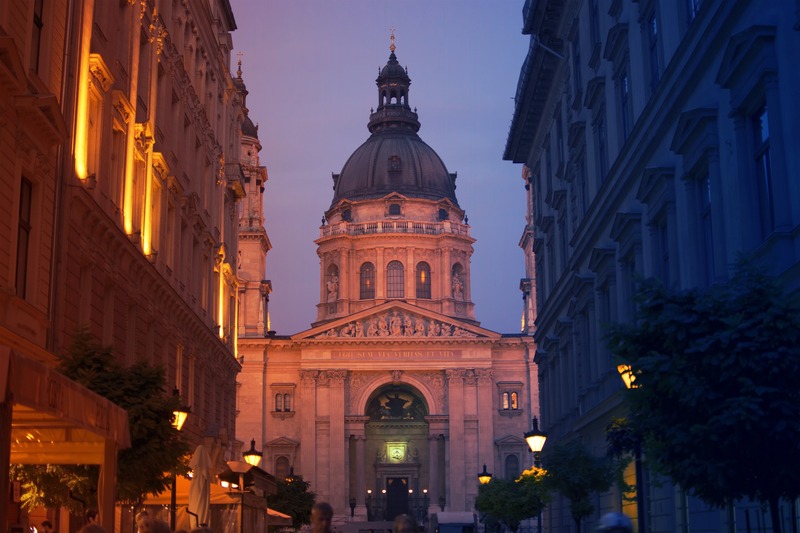 There’s a lot to be explored in this city dissected by the Danube. However, a wrong choice of an accommodation can completely ruin your experience. 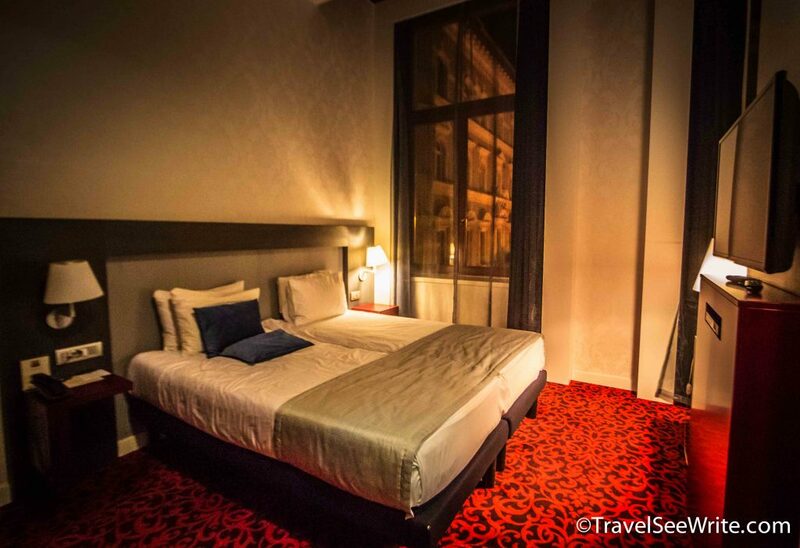 The four-star Hotel Palazzo Zichy is a consistent favourite among people looking for refined taste at an affordable price. 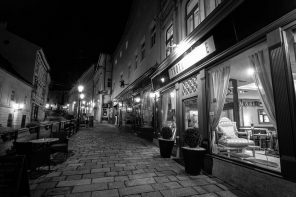 Here is my personal experience of staying at this classy property that makes it one of the best hotels in Budapest. WHY choose Hotel Palazzo Zichy? This is the most critical part of my holiday planning. Located in the heart of downtown, in Palace quarter of Budapest, it is right behind the National Musem. 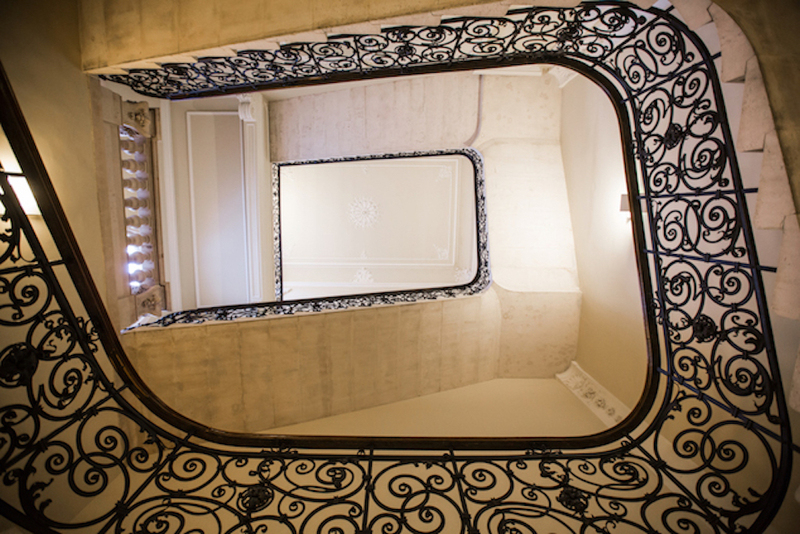 My favourite way to explore a city by walking and Palazzo Zichy fit the bill perfectly. It is five-minute away from the Hungarian National Museum, 8-minutes from the pedestrian area, just one block from the Grand Boulevard and 15-minutes away from Váci utca and the Parliament building. 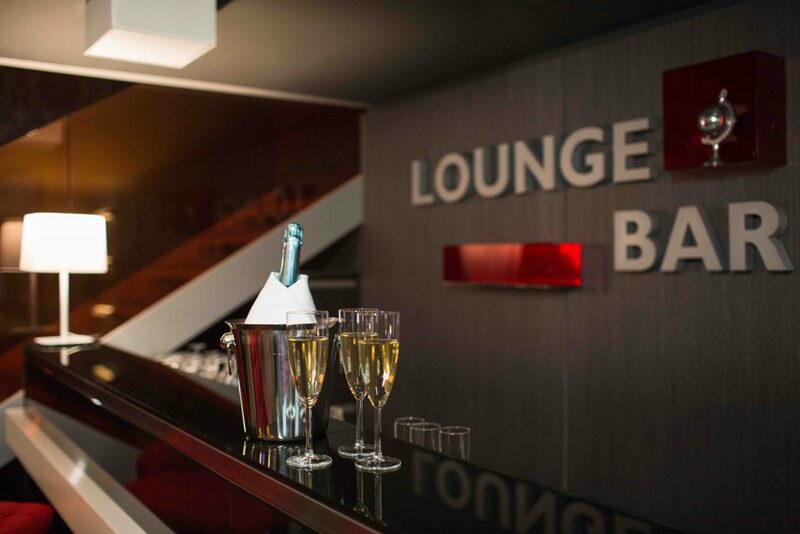 While there are a lot of eating options within the hotel, there is also a convenient cluster of good café-bars a little way along Mária utca. Tram and bus stations are just around the corner. Taxis are available 24×7. If you are staying in a city renowned for its nineteenth-century architecture, how can your accommodation be left behind? Hotel Palazzo Zichy was once an elegant palace (which it still is) built in 1899 by Count Nándor Zichy, a nobleman. As you walk in, you come across the high windows of the palace façade embellished with carvings of seashells and garlands and other Rococo details. Once you are Inside, you’ll be surprised to find how the overall thrust of the design is slick and modern. Seems like the modern architect time travelled to the 20th century to marry the two eras. The striking feature for me was the lobby – once the inner courtyard – a striking combination of highly polished black floor and glass pyramid roof. The hotel still retains its original gems like the surrounding walls, the chandelier at the entrance and the ornate black balustrade running up the staircase. Breakfast decides the mood and pace of my day. A good breakfast means a good day. And, Hotel Palazzo Zichy knows exactly how to delight its customers. 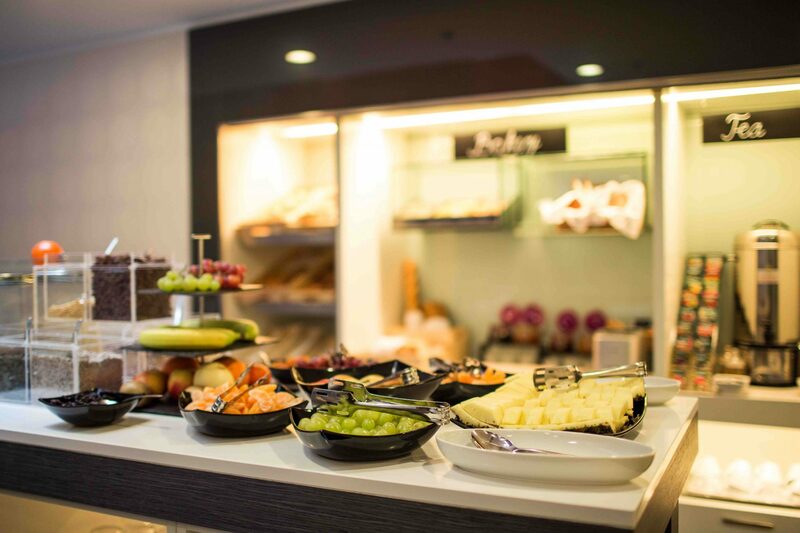 A full buffet breakfast is served in the glass-roofed restaurant daily. There are separate counters for all kinds of foods – hot dishes, cold cuts, cheese plates, salmon, grilled and fresh veggies, selection of cut and whole fruit, locally baked bakery products, gluten-free items and a lot more. And guess what? You can order a Sparkling Wine or a cocktail too. Now isn’t that starting your day on a high, literally and figuratively. All 80 rooms are well furnished. While the hotel has classy appeal, it is backed up with all modern technologies to make sure guests have a pleasant stay. 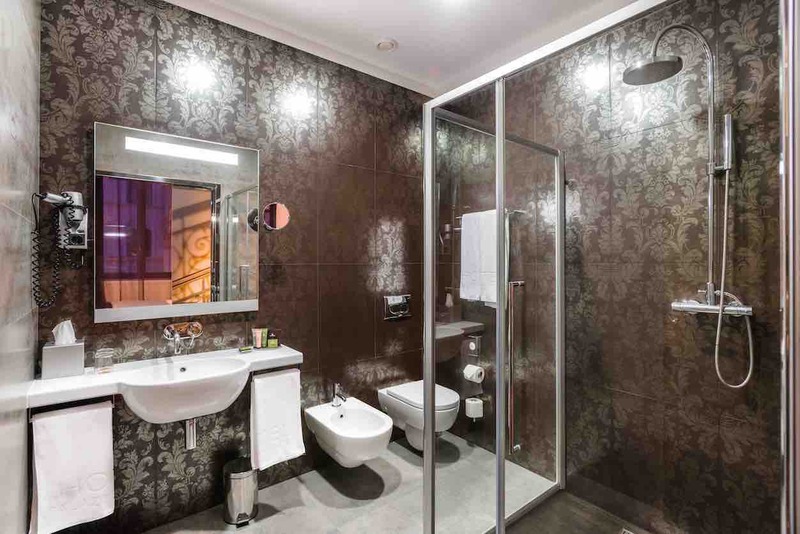 It was a perfect combination of class and avant-gardism, with grey laminate flooring, silver fleur-de-lis motifs on the wallpaper and frosted glass bathroom doors adorned with images of architectural details from the palace. In my bedroom, I had a desk and chair, TV with DVD player, safe and mini-bar, while bathrooms were well stocked with toiletries. 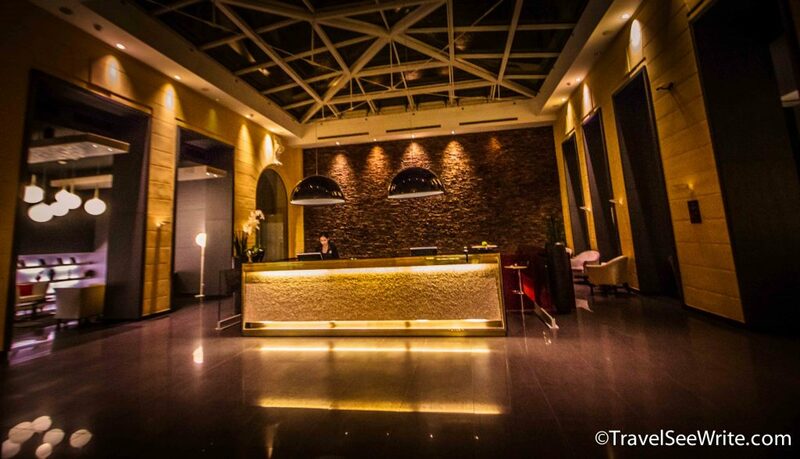 Hotel Palazzo Zichy is a charming place where history meets present. While there is no in-house restaurant, the Hotel more than provides more than what its customers need – a lavish breakfast buffet, complimentary coffee/tea and the most unique offering – unlimited access to Sauna. 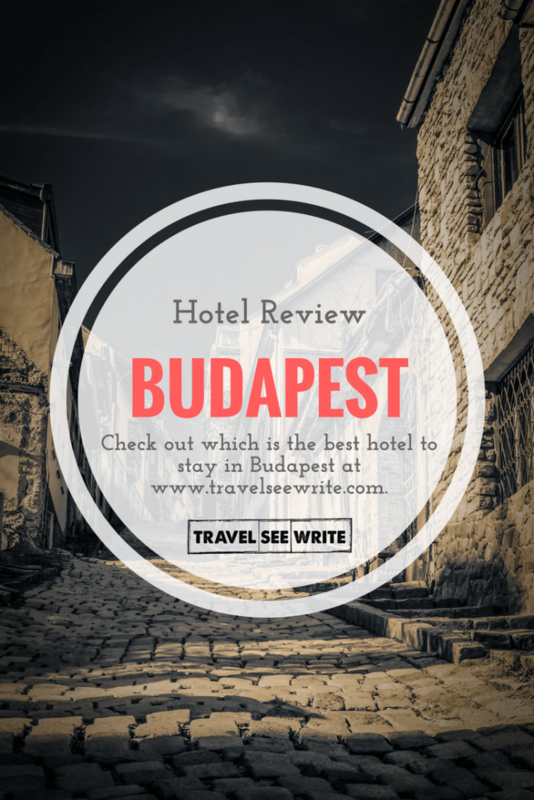 Now isn’t that a great offering to qualify it as one of the best hotels in Budapest? The staff at Boutique Hotel Seven Days was very courteous and prompt to answer my queries. Right from the booking inquiry until I checked out, they ensured I was well taken care of. They even emailed me to check if I had a comfortable stay or not. Big cities mean big expenses. And, Budapest can really burn a big hole in your pocket, if not planned well. Thankfully there are hotels like Palazzo Zichy that keep the cost in check. The Superior rooms start from €90 (£64) and Junior suites from €120 (£85), including breakfast. No service fees, no cancellation fees. 24-hours customer service. Open for requests also for the closed dates. 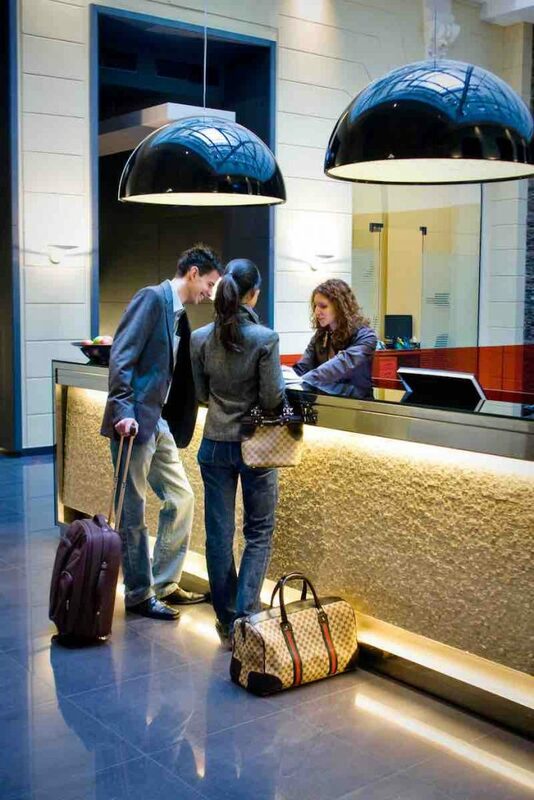 No handling fees and direct payment in the hotel. 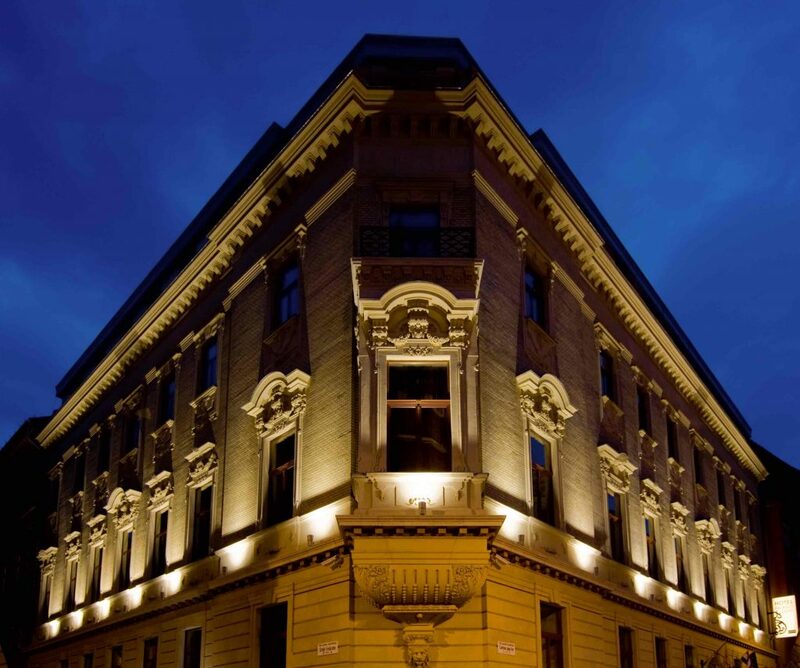 So, this was my take on why Hotel Palazzo Zichy one of the best hotels in Budapest and I would recommend it to anyone who is looking for classy experience at value for money price. 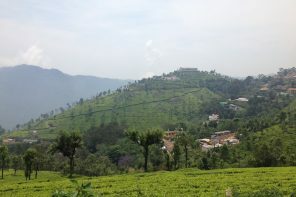 Have you ever stayed at any such place? If yes, I would love to hear from you. I was hosted by Hotel Palazzo Zichy in October 2017. However, as always, the views are mine and based on my personal experience. The pictures are either taken by me or provided by the hotel. 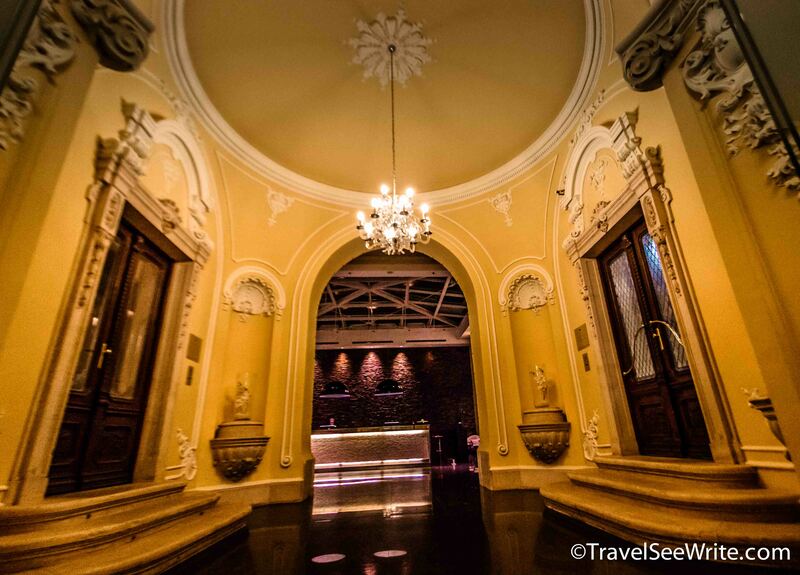 I love heritage hotels like Hotel Palazzo Zichy. It would definitely be the kind of place I’d head for, though I prefer a more traditional style of bedroom (not bathroom). Budapest looks stunning too. This hotel looks delightful. 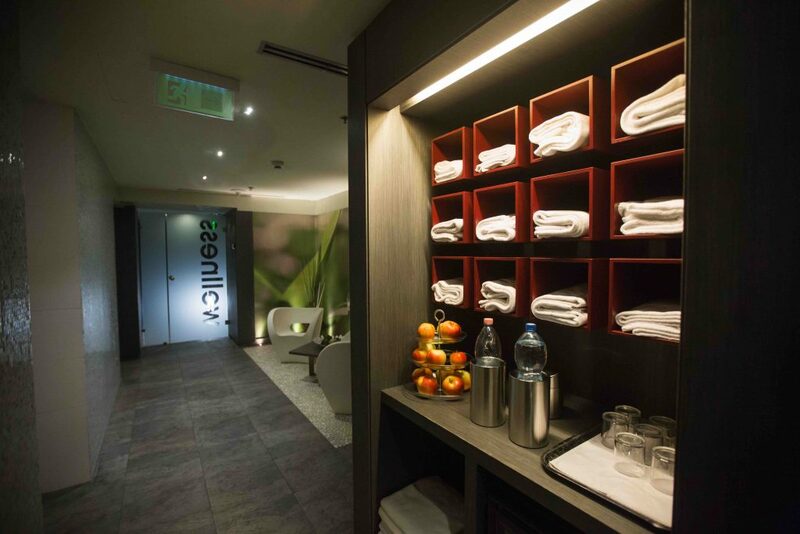 I love how there is a fusion between old and new and the wellness sauna looks pretty inviting too. Budapest is one of my favorite cities – in fact, I find it one of the most romantic cities in the world. Palazzo Zichy seems like a great place to live in Budapest. Would check them out as and when I visit the city again. Great that this place is in such a convenient place to explore the city on foot! I totally get that hotels are the most important part of holiday planning. 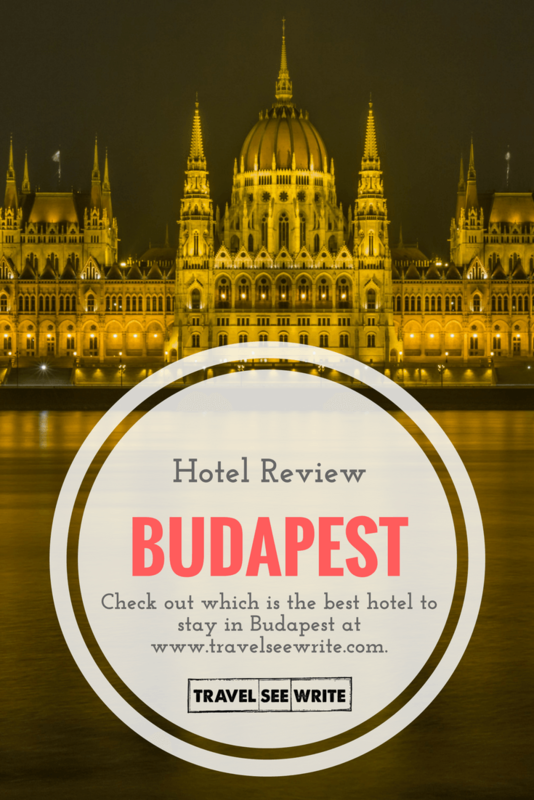 I stayed in two different budget hotels in Budapest and had pretty miserable experiences at both of them, and it really did color my entire view of the city. Will have to keep this place in mind if I ever return! Wow, looks like an incredible hotel to stay in, it might be a little too much out of my budget haha. I do love the fusion between old architecture and modern sleek design, like you said it does look like – modern architect time travelled to the 20th century to marry the two eras. I’m planning to make it back to Budapest in the near future, and I’d love to stay at a place like this. Palazzo Zichy is definitely gorgeous, and their breakfast buffet looks delicious, which is always something I consider when looking for a good hotel. I’m also a fan of their unlimited saunas, even if Budapest is the best city for baths. Budapest is such an incredible city! Glad you found a nice hotel that walkable to some major sights. 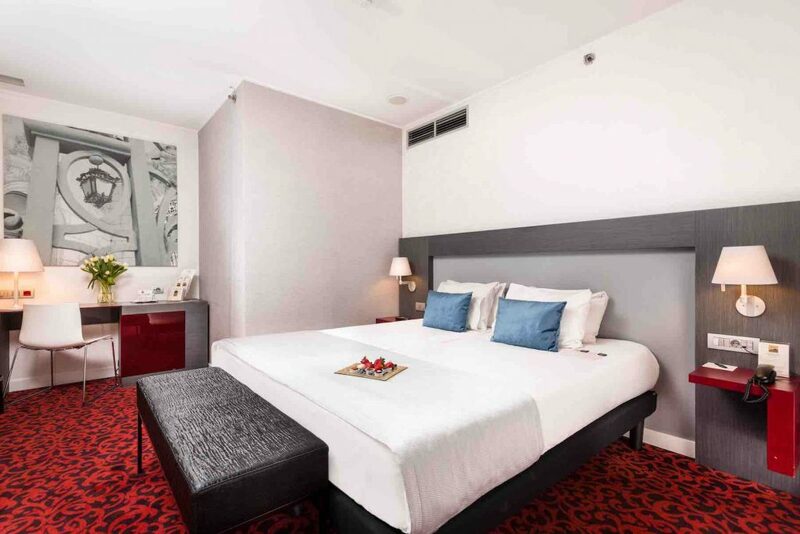 It’s interesting to see how the hotel’s modern elements mix seamlessly with the older design. With the exception of the entrance and the lobby. But that’s kind of fun to see the stark contrast in design when walking from one to the other. Your not kidding, the Palazzo Zichy looks like a great hotel in general. But you sold me with the location. I too usually look for hotels that will allow me to walk to main attractions that I want to explore or at least near a metro/public transport system and Palazzo Zichy definitely fits the bill. The bonus is that you get a great looking room for a fair price! Palazzo Zichy sounds really wonderful. 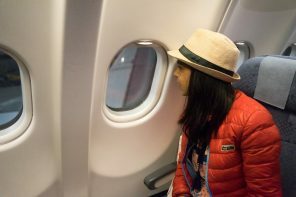 I love that it’s right in the historical district – that’s huge for travelers! Plus that buffet sounds wonderful. It’s great when you can get a nice meal from your hotel! I absolutely adore Budapest, though the couple of times I visited was back when I was backpacking Europe, so we stayed in hostels. 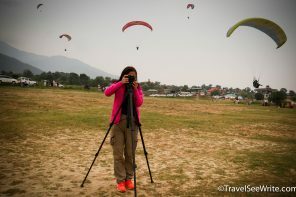 I would love to get back now that my travel style (and budget!) 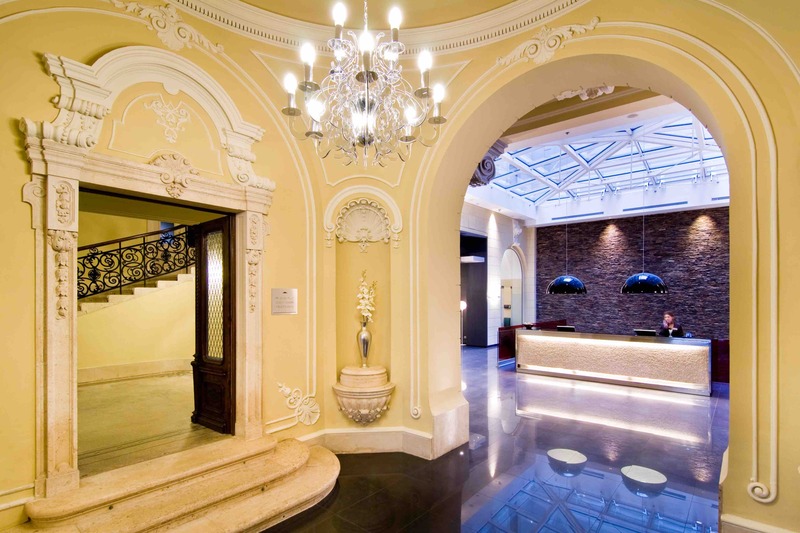 has evolved into hotels, and the Palazzo Zichy sounds wonderful – location is one of the biggest keys for me these days, so that fits the bill perfectly. But ultimately I go for unique accommodation experiences these days, so I love how much character the hotel exudes! I love how classy and modern the hotel is, while retaining it’s history. Thanks for this recommendation – sounds like gold! Wow, this hotel is breathtaking. Very classy and elegant. Almost makes me regret not staying there instead of my Airbnb. (But I ended up becoming friends with my Airbnb host) Budapest is a beautiful but underrated city but I think that slowly changing. 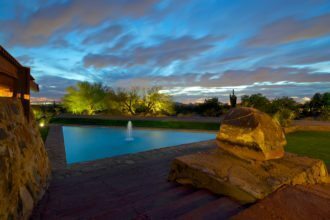 The location is fantastic!!! Staying in a hotel right in the downtown is always my aim when I travel, so that everything is easy to access. 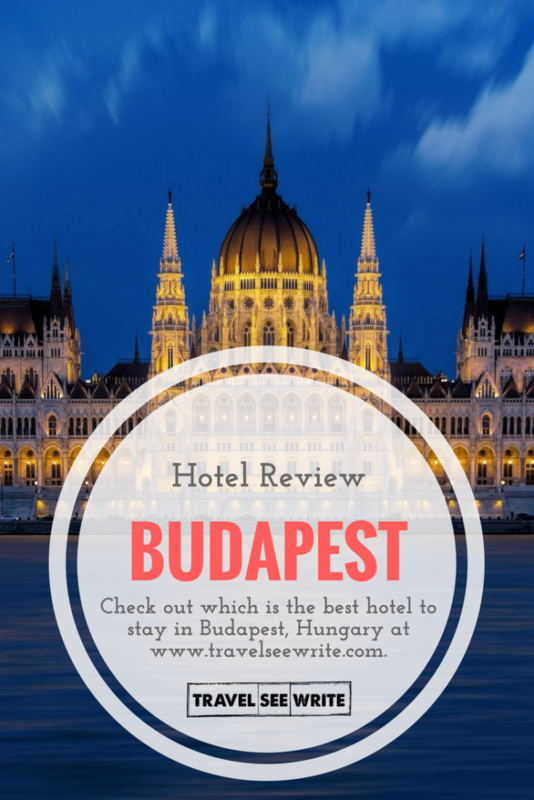 I’d love to visit Budapest one day and Palazzo Zichy looks like the perfect hotel to stay in, considering it is only a walk away from the best places to visit, and just like you, I love walking too! 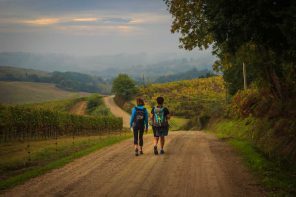 love this article, it is very detailed.